Nikon D800E with Nikkor 24-70mm and Hitech GND 0.9 Soft & Polarizer 1/10s, f/9.0, ISO50. 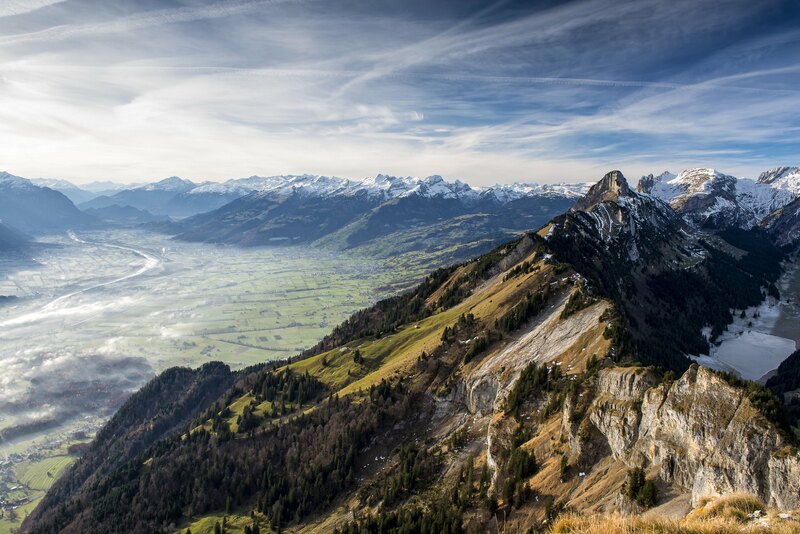 Taken on the mountain Hoher Kasten, view to the south, Rhine Valley with high snowy swiss mountains in the background. The Rhine Valley (German: Rheintal (help·info)) is a glacial alpine valley, formed by the Alpine Rhine (German: Alpenrhein (help·info)), i.e. the section of the Rhine River between the confluence of the Anterior Rhine and Posterior Rhine at Reichenau and its mouth at Lake Constance. From Reichenau, the Alpine Rhine flows east, passing Chur and turning north, forms the border between the Canton of St. Gallen of Switzerland on the left (west) side and first Liechtenstein and then Vorarlberg, Austria on the right (east) side. The Swiss-Austrian border follows the historical bed of the Rhine, but today the river follows an artificial canal within Austria for the final 5 kilometres (3 mi). The Rhine Valley extends to about 80 kilometres (50 mi). Its upper third has the character of an Alpine valley, enclosing a bottom plain of about 1 to 4 kilometres (0.6 to 2.5 mi) across. Downstream of Vaduz, the valley widens considerably, developing into a broad plain, measuring some 10 kilometres (6 mi) across at its lower end along the southern shores of Lake Constance. From the point of the Rhine's emergence from Lake Constance, it is known as High Rhine. Tributaries of the Alpine Rhine are the Plessur, Landquart, Ill and Frutz rivers on the right side. It has no major left tributaries; rivulets joining it from the left are Oldisbach at Chur, Cosenz at Untervaz, Säge at Tardisbrücke, Tamina at Bad Ragaz, Tobelbach at Burchs, Simml at Gams.